Hey friends, it’s Rachael again sharing info on this month’s plant of the month, the trusty ALOE VERA. Aloe vera is a succulent – as are all species of Aloe – since they store water in their thickened leaves. Aloe vera llikely originated in Sudan but is now found in warm to tropical climates around the world – like here in the Southeastern US, Mexico, Australia, South America, the Caribbean, China and even Southern Europe. It is believed that people brought these plants back to their native homes and cultivated them in part to their ease of growth, but also mainly due to the many medicinal benefits these plants provide. Along with the medicinal benefits of the leaves, Aloe vera are great air purifiers, cleansing the air of many harmful indoor air toxins such as benzene and formaldehyde (which are often off-gassed by-products of common chemical based cleaners, paints and furniture materials). In fact, aloe vera are one of the plants identified as powerhouse air purifiers by NASA (SOURCE) . It is recommended to have 1 plant per 100 square feet of interior space for most effective air purification results. The larger the plants the more purification potential. 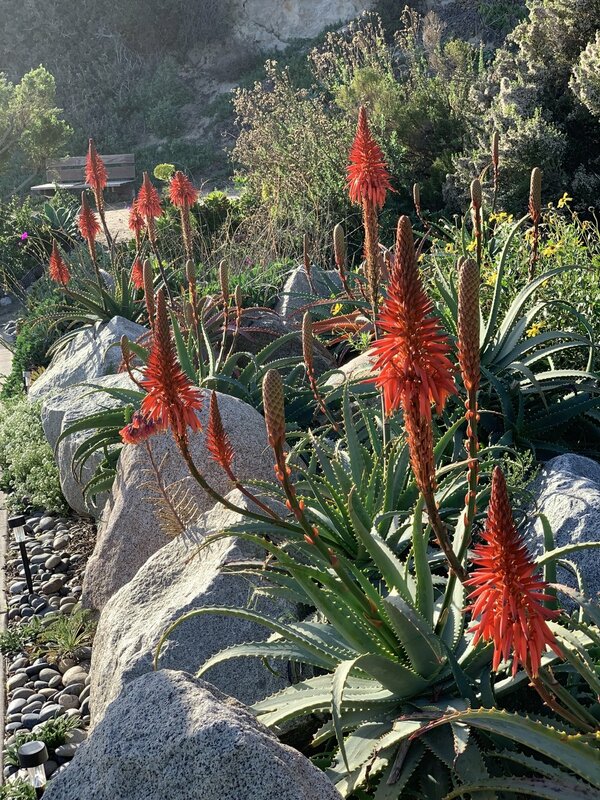 Aloe vera are easy to care for and maintain while making eye-catching statement plants style wise as well. They reproduce readily when properly cared for, so are easy to propagate and gift to friends! LIGHT: Low sunlight to direct sunlight is best. In full direct sun they will often take on a maroon color, especially in their leaf tips. Be careful to acclimate them to full sun or else they do tend to burn. These plants do well in low light areas indoors as long as they are not overwatered. WATER: Water only when soil is completely dry – water thoroughly and allow water to drain. Do not overwater. Will need more water in brighter hotter conditions, than in cooler and shadier conditions. CONDITIONS: These amazing medicinal plants thrive in more temperate climates and do not tolerate frost or cold drafts well. They prefer warm temperatures and indirect light. They also prefer well-draining soils, so if planting in pots make sure to use a cactus blend soil, or add some pumice or sand to your houseplant soil to ensure it does not retain too much moisture. RACHAEL COHEN is the creator & owner of INFINITE SUCCULENT, a plant art, styling and educational service in San Diego, Ca. Through her art and styling, as well as her writings & workshops, Rachael connects and engages her clients with the natural world. Simultaneously, she helps them achieve the botanical atmosphere of their dreams! Rachael’s book of succulent crafts - Infinite Succulent: Miniature Living Art to Keep or Share - will be released end of February 2019. Have any further questions about Aloe Vera care? Reach out on our Ask the Botanist page.